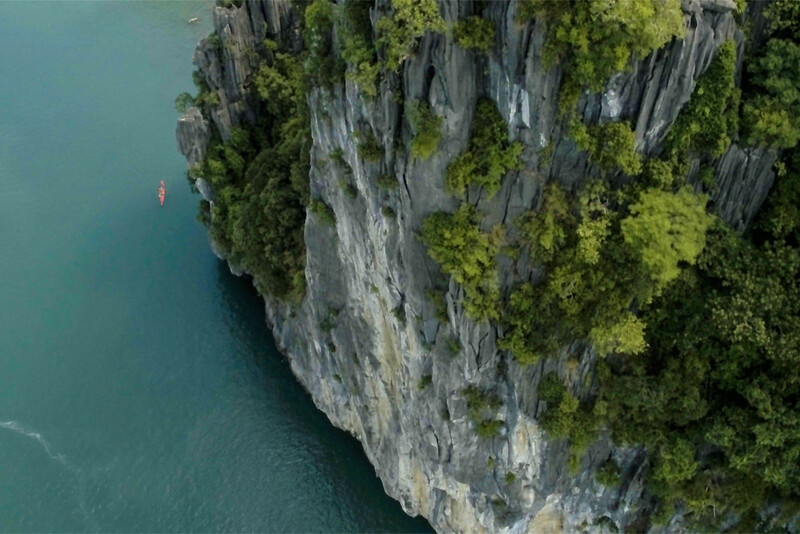 Bai Tu Long Bay - Epic Video Highlights And Top Tips! Leaning on the wooden handrail of our boat, we looked out at the incredible view in front of us. 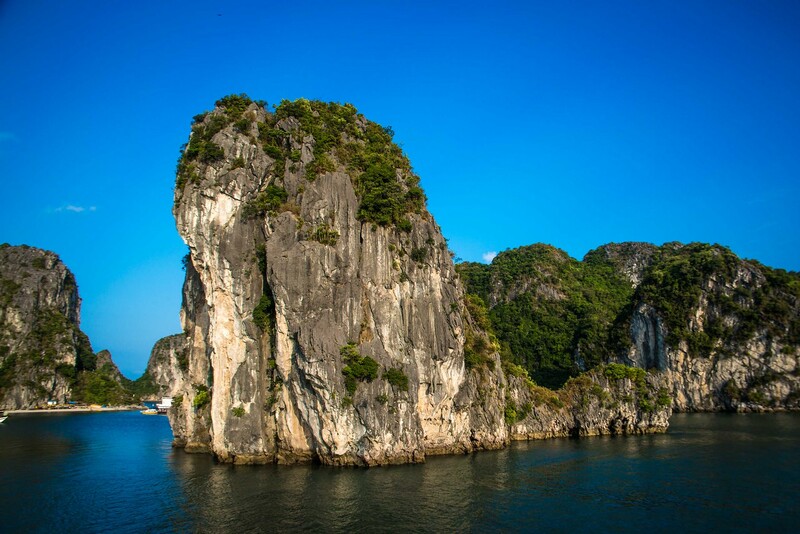 Hundreds, perhaps thousands of towering limestone karsts protruded from the lush turquoise waters of Bai Tu Long Bay. We were back in Bai Tu Long Bay, the magnificent World Heritage site in the North of Vietnam. This was our second trip on the bay, and it was just as spectacular and awe-inspiring as the first time! Take a glimpse by watching our epic highlights video below! 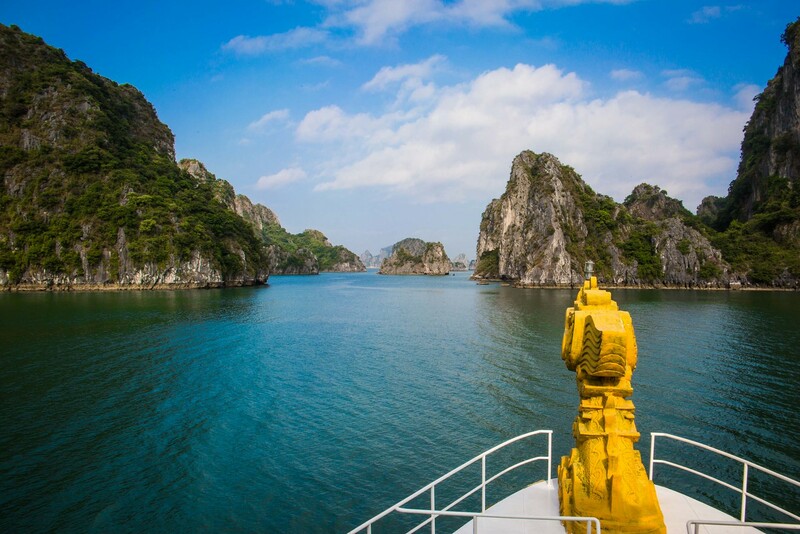 Halong Bay, or to be precise, Bai Tu Long Bay, the private area of the bay where our Dragon Legend cruise took us, is a place of outstanding natural beauty. Covering a total area of 1,500 km2, Halong Bay extends out as far as the eye can see, filled with beautiful islets and limestone karsts. Each totally unique in shape and colour, rich with bright green blooms of jungle vegetation. 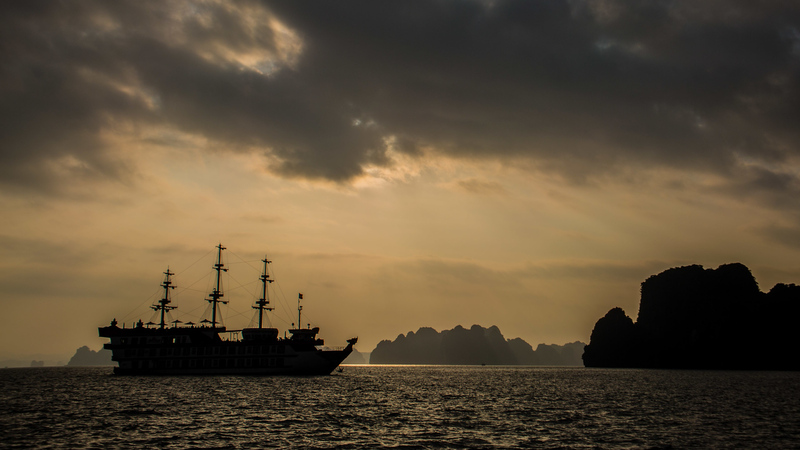 It was a dream come true to return, especially because we were back with the same tour company who took us on our first adventure to Bai Tu Long Bay 3 years ago, the awesome Indochina Junk. But this time we were on the larger and rather grand new ‘Dragon Legend II’ cruise ship. It was so exciting!! The scale of Halong Bay is hard to comprehend. With thousands of limestone karsts and islets stretching for an incredible 120km of coastline, it’s truly a sight of epic proportions. However, as you pass through the various islets and channels, it becomes hard to truly appreciate their scale, so the best way is to get up close with the karsts in a kayak! 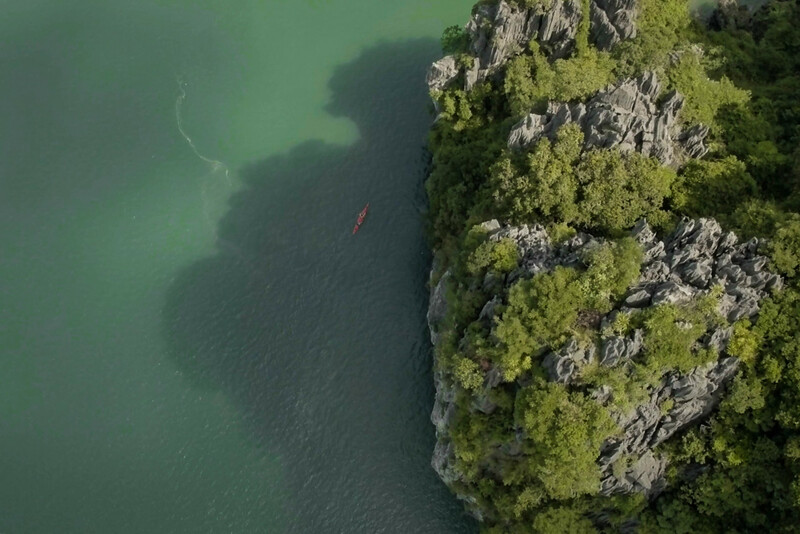 Slipping into a small kayak, and paddling away from your ship, immediately gives you a much better sense of the scale and grandeur of Bai Tu Long Bay. 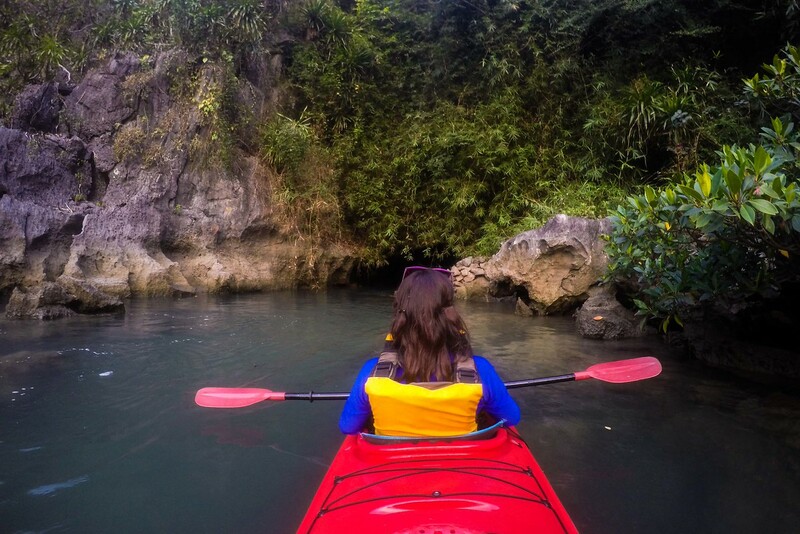 The limestone karts are simply enormous, and dwarfed our tiny kayak as we paddled around them! Yes that is us in our kayak! As the tide ebbs and flows, it reveals different colours on the karsts as the water gradually works its way into the base of each karst. The result is a spectacular top heavy rock, many of which you feel could push over given enough leverage. As you paddle close to the karsts, they come to life as thousands of small grey crabs cling to the sides, scuttling in and out of the various holes and crevices at the bases. Looking up, the lush green vegetation and bushes protrude from the sides of the karsts, demonstrating an uncanny knack for flourishing in the most unique of places. Up ahead, lay a small entrance in the never ending karst’s wall which, amazingly, turned out to be the access point to a secret lagoon, only accessible at certain tide levels. Our luck was in today, as the tide was low enough to paddle through. So we slowed our kayak, and entered the darkness. 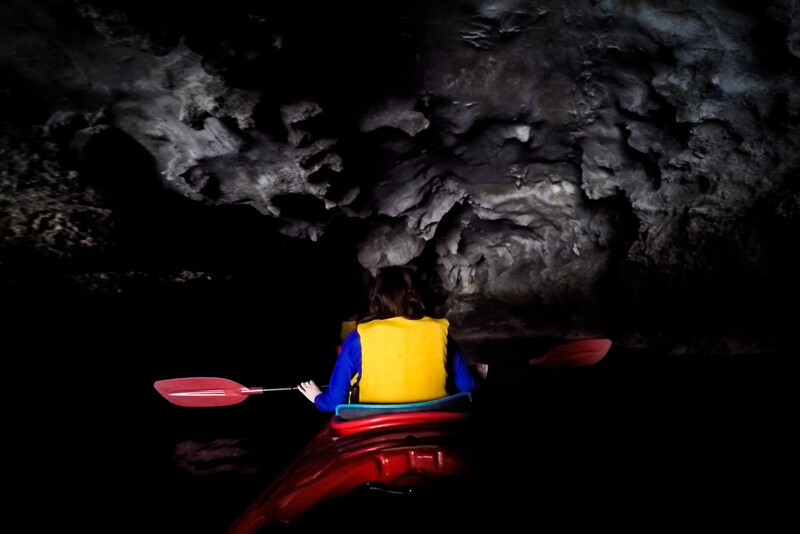 Navigating in darkness through a cave is difficult as you can imagine, the various stalagmites hanging down threatening to hit our heads, whilst the shallow waters gave many opportunities for capsizing. However after 5 minutes or so of slow and not so steady paddling, we saw daylight up ahead! Blinking as we entered back into the daylight, we looked to find ourselves in a large lagoon, surrounded on all sides by towering limestone cliffs, woah! The water here was calm and serene, and the lagoon almost silent with only the sound of swooping birds and the echo of our voices. We naturally stopped paddling to enjoy the moment, it was such a beautiful place. It was a strange feeling being in the lagoon, knowing the only way out is back the way we came! So after some moments of tranquility, it was time to head back through the shallow waters of the cave and follow our guide back to our ship, before any major tidal changes! What an adventure it had been! Extremely satisfied from our amazing lagoon adventure, we returned to the ship to get ready for our next adventure to Thien Canh Son cave, the location for our dinner that evening. And what a setting it was! 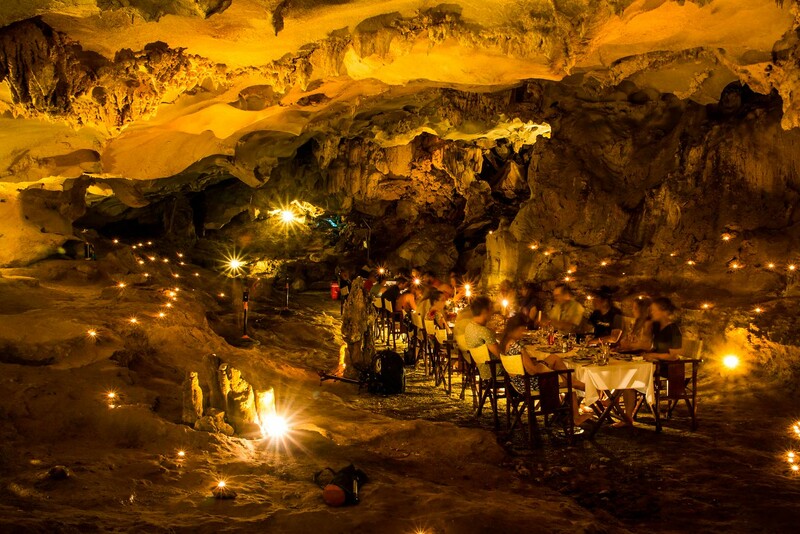 Our amazing cave dinner setting! Aside from enjoying all the delicious fresh seafood and our favourite Vietnamese dishes (have we mentioned how much we love Vietnamese food?! 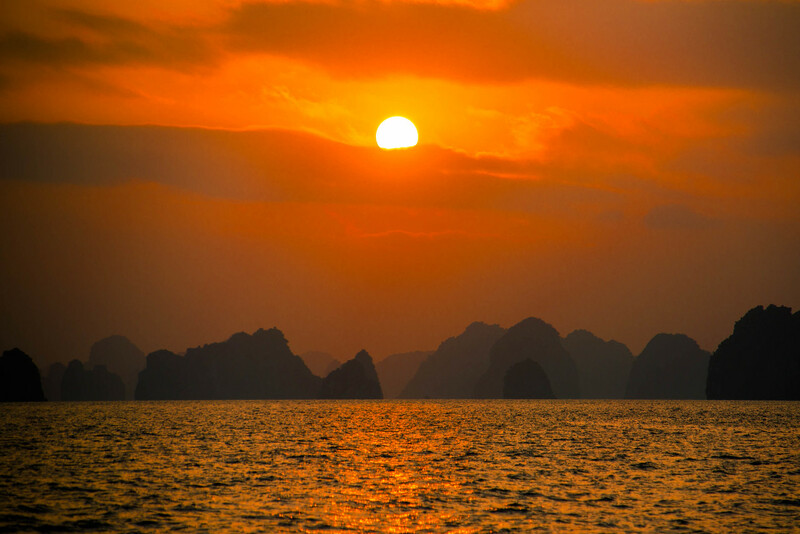 ), the other highlight of our time on Bai Tu Long Bay was once again the incredible sunsets. Set against the hundreds of limestone cliffs, with the right mix of clear sky and cloud, they are truly magical and unique! There’s nowhere else quite like Bai Tu Long Bay and for us, it has a unique way of making us feel calm and relaxed. 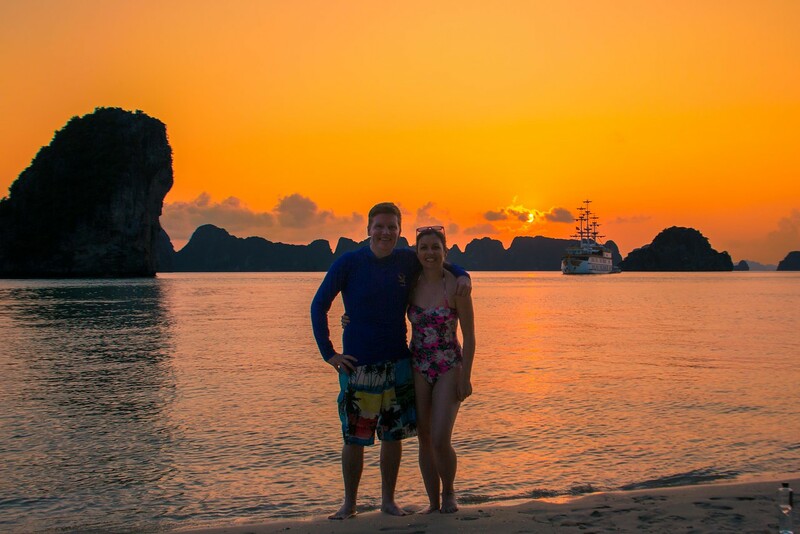 We also had time to chill out on a mini beach at the foot of a huge karst to watch another incredible sunset! With only miles and miles of beautiful karsts and the occasional boat slipping by, there’s no wonder it’s a great place to clear the mind and truly live in the moment. The sunrises weren’t too shabby either! We witnessed some rather atmospheric and moody clouds surrounding our boat over the bay…! The last day of our 3 days, 2 nights tour was just as exciting and rewarding. Starting with an early morning visit to the floating fishing village of Vung Vieng, we got a fascinating glimpse into the floating lives of the local families who inhabit the area. The village is beautifully surrounded by a spectacular wall of karsts, best viewed from a small boat, so once again we disembarked our ship and slipped into these small rustic rowing boats to tour the peaceful area. 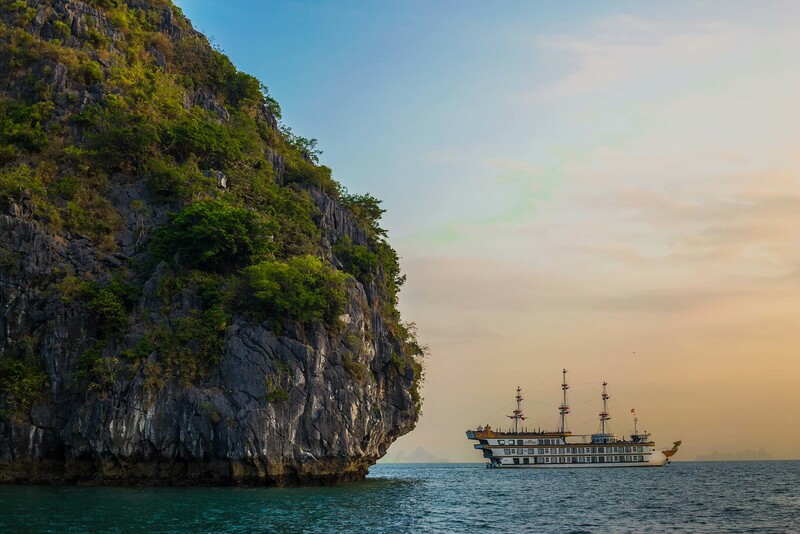 Despite this being our second visit, we absolutely loved our time on Bai Tu Long Bay again, especially with the wonderful crew of the Dragon Legend cruise ship from Indochina Junk. 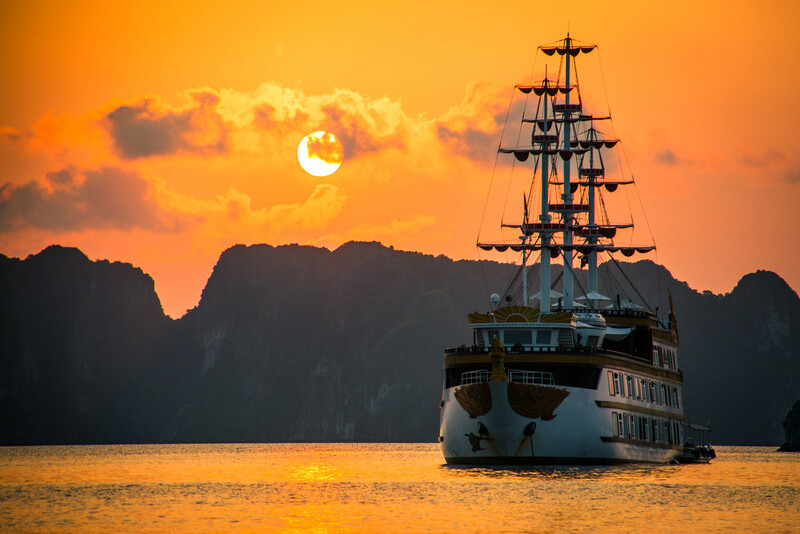 We would highly recommend this cruise, or any of Indochina Junk’s tours. It’s not often that we make such bold recommendations about a company however based on both of our amazing Bai Tu Long Bay experiences (you can read about our first visit here!) and our incredible Yen Duc Village tour, we’ve always had awesome, authentic, professional and friendly experiences with them. 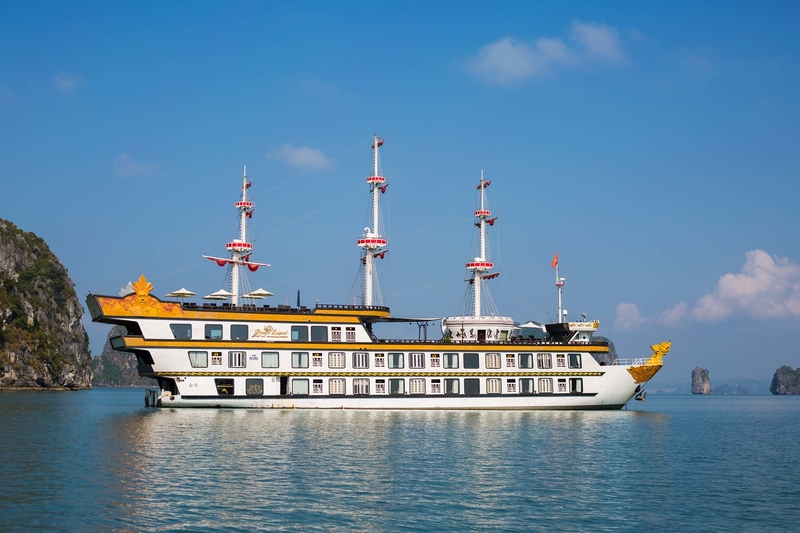 A cruise around Bai Tu Long Bay could be the highlight of your trip. It certainly was for us. Choose your company wisely! Unfortunately many visitors to Halong Bay don’t have such a positive experience. Stories of rat infested boats, boat traffic and polluted waters are enough to put anyone off! However if you do your research properly and don’t take a super cheap option, you should have an amazing experience. As we’ve said, we highly recommend Indochina Junk based on our experience. Loosen your budget and splurge a little! It can be tempting to cut costs and go for the cheaper option, but when it comes to this once in a lifetime experience, we recommend stretching your budget a little! The time will fly by so go for at least 2 nights! It takes at least 4 hours to get to Bai Tu Long Bay by car from Hanoi, so going for just 1 night really makes for a flying visit. 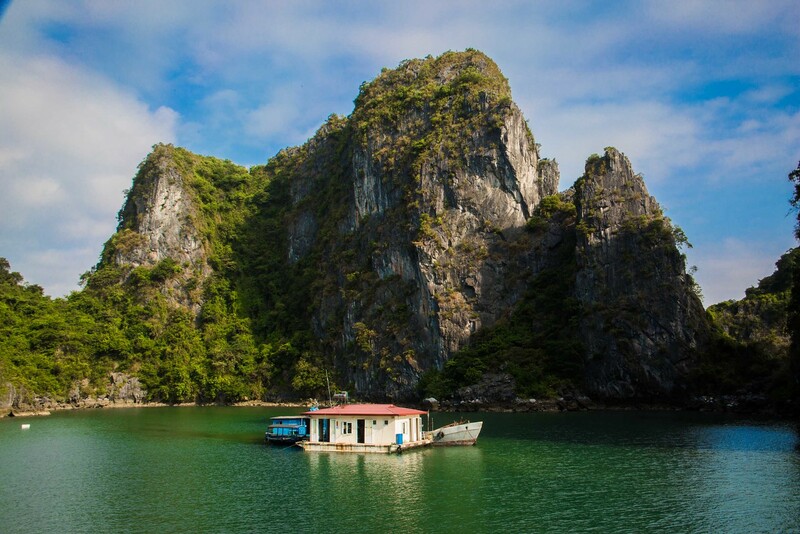 The last day of most itineraries (including a 2 day 1 night option) consists of an early morning breakfast, short morning excursion (final boat or kayaking trip) then return to Halong Bay port by lunchtime so if you only go for 1 night you will probably be on your boat for less than 24 hours which is just so short! We found that the time really flies by, especially including meals and excursions so we recommend booking at least 2 nights 3 days to make the the most of it! You can find the full detailed itinerary of what to expect on the 3 days 2 nights trip that we took over on the Dragon Legend website. Disclaimer: we partnered with Indochina Junk for this trip, but as with everything on our blog, our opinions above are an honest account of what we experienced. 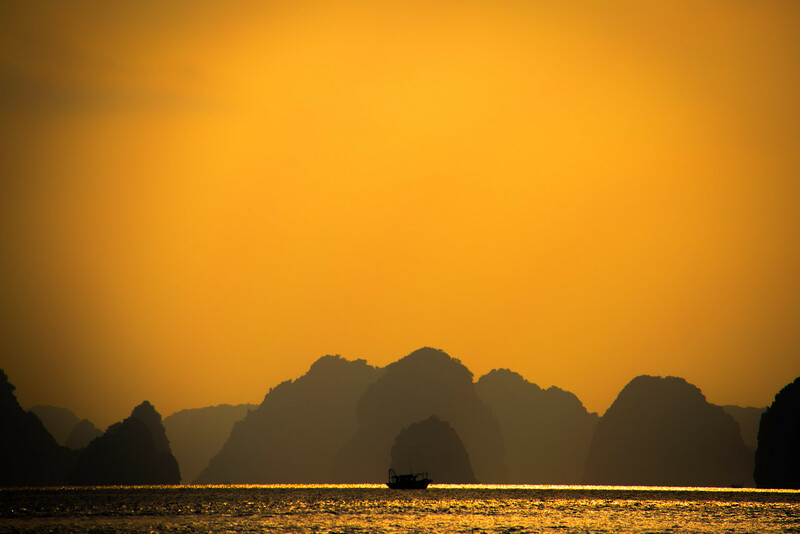 Looking for more Vietnam inspiration? Click here. 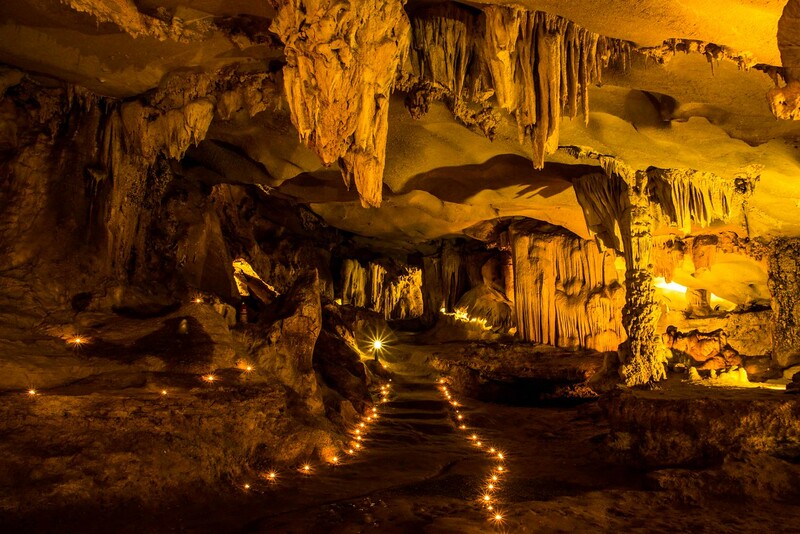 Or, considering a trip to the similarly beautiful limestone karsts of El Nido, Palawan in the Philippines? Check our our experience and tips on El Nido Tours here. Epic video guys! Looks like an awesome adventure. I agree a one-day trip doesn’t do Halong Bay justice. Thanks Meghan! It was an awesome adventure indeed and we were lucky with the weather! 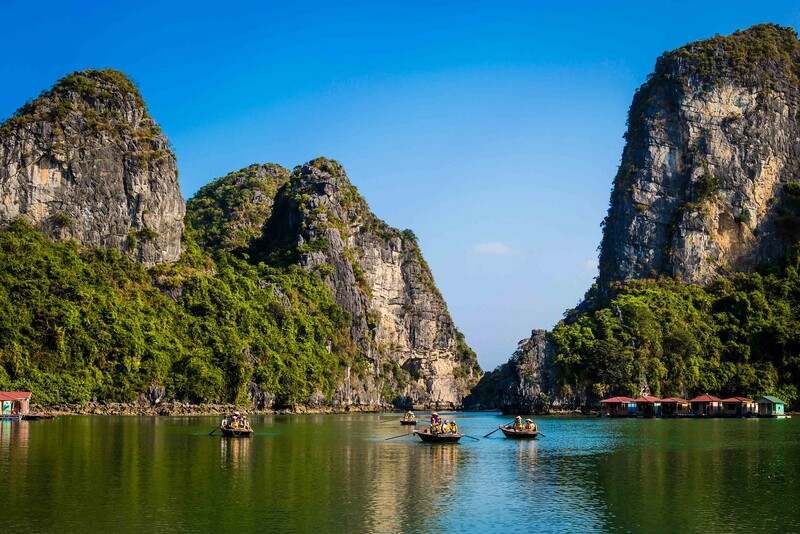 We try and persuade everyone we meet to take 2 nights on Halong Bay as 1 night would just fly by! Fantastic photos guys! 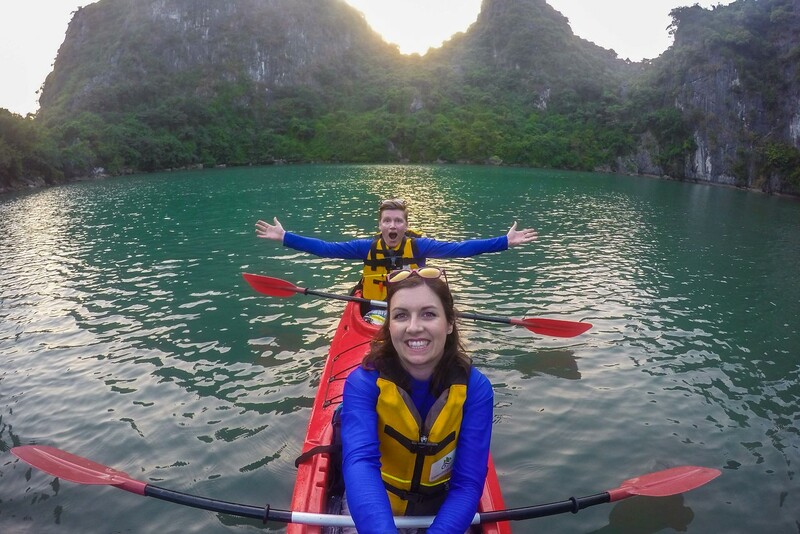 We decided to skip Halong Bay despite spending 6 weeks in Vietnam due to the cost. We decided instead to come back one day and really splurge on this special experience. Now I am itching to be back sooner rather than later! Thanks Jenia, Halong Bay is incredible but you’re right, it’s best to splurge a little rather than have a bad experience! We’ve now been twice and we still want to go back! Great pics and video, how did you get the Ariel shots, they look great. Don’t tell me you also packed a drone? I wish I had a drone Brez! We were lucky enough to have a local drone team with us on the boat, so they captured all of that awesome footage! I don’t think my bag could handle any more technology! 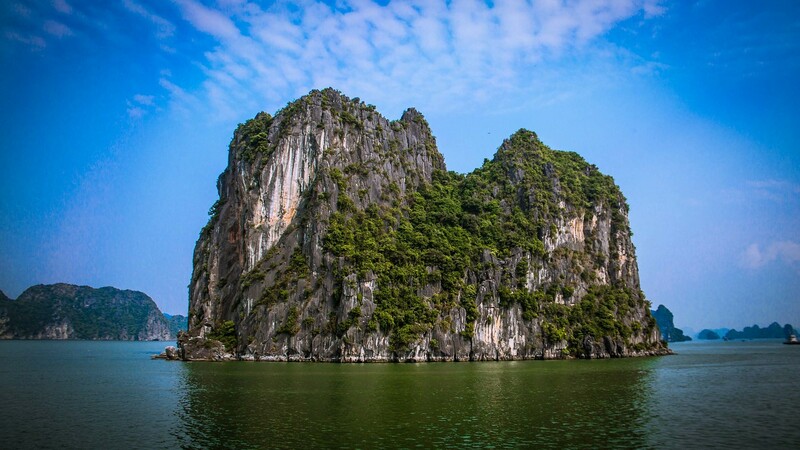 This is the first blog i saw with stanning blue sky in Halong Bay. Absolutely stanning pictures, very nice sunset . May I know what month did you travel? Hi Sharc! We visited Halong Bay at the end of October/beginning of November! Great pictures of this wonderful bay! I love Halong! The video is incredible, those drone shots really show off this incredible bay! Really hope on our trip we get beautiful blue skies like you guys got, stunning photos!! Even more looking forward to our first trip to Vietnam (and Halong Bay) February 2017. Thanks for all the excellent info Barry and Laura. Tks your stunning photos Laura. Personally I think you visited Ha Long in the very right time (Aug-Dec) to catch clear and blue sky . Our Ha Long is as valued as Bali to the Indonesian :). we love it not because it help us earn more but bring the world to Vietnam and introduce Vietnam to the word. just hope the travel blooming recently won’t erase that coastal wonder. Please be a kind and responsible traveler. Welcome to Vietnam! Thank you very much for your kind comment guys! We certainly loved our time in Halong Bay, but also hope that the travel boom doesn’t spoil it. What a special place it is, best seen in peace and quiet. Best wishes to you.